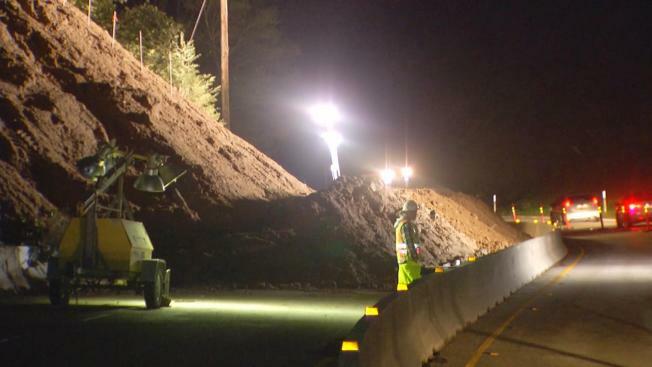 A troublesome mudslide along Highway 17 in the Santa Cruz Mountains that has triggered traffic nightmares for drivers for almost one week is expected to be cleared by Tuesday night, according to Caltrans. Bob Redell reports. A troublesome mudslide along Highway 17 in the Santa Cruz Mountains that has triggered traffic nightmares for drivers for almost one week is expected to be cleared by Tuesday night, according to Caltrans. The mudslide, which is located on northbound Highway 17 between Vine Hill and Sugarloaf Roads, originally came crashing down last Tuesday. The two southbound lanes of traffic have been split to allow drivers to traverse between Silicon Valley and the coast. Drivers on Monday should expect 20 to 30 minute delays, according to Caltrans. Fixing the problematic hazard has been tricky and dangerous. One worker was killed last Thursday and another one was injured after they were hit by a dump truck. Local businesses and residents have also been forced to adjust their schedules and routines as a result of this mudslide and slew of others that have dotted the area this winter season. Crews near the Highway 17 mudslide are also assessing how to fix State Route 35, known as Skyline Boulevard, after a gaping hole appeared Friday afternoon.